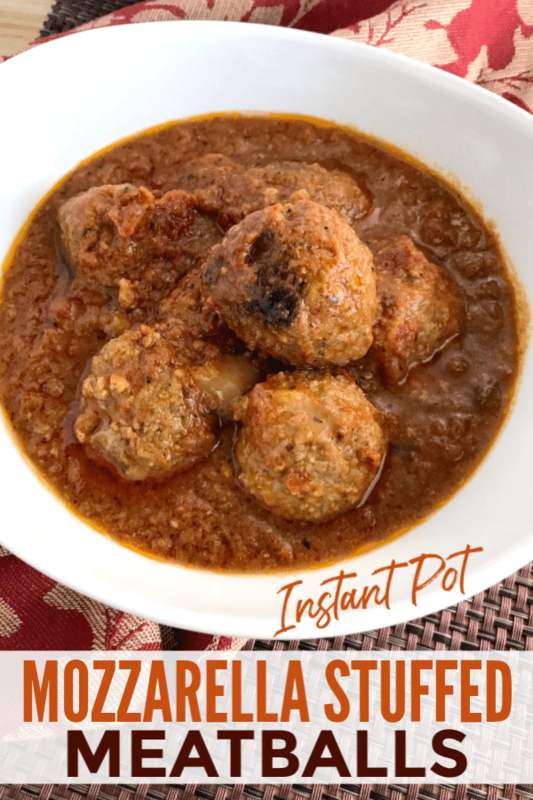 These Instant Pot Mozzarella Stuffed Meatballs are the perfect solution for parents who are watching carbs but still want to make meals the whole family can enjoy. 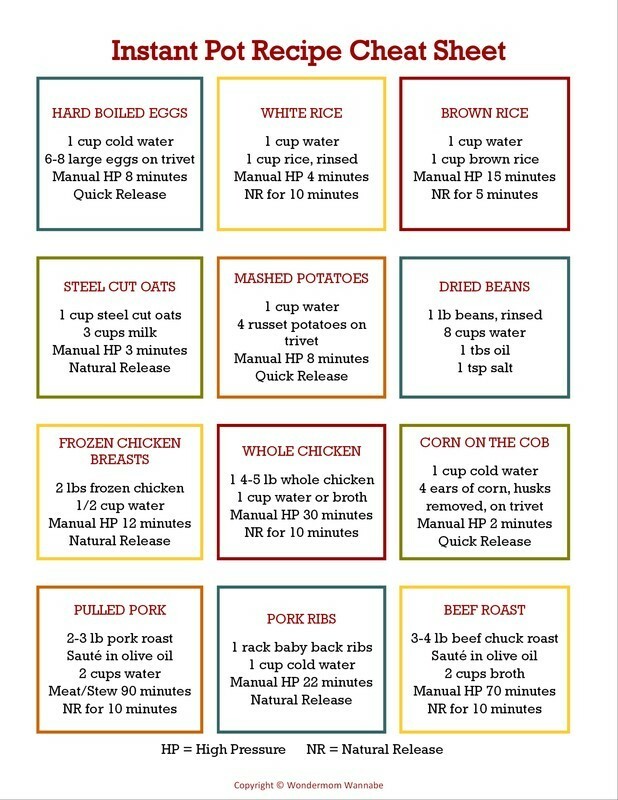 Your kids will not only NOT complain about this low-carb dinner, they’ll be begging you to make it every week! Even though I don’t consider myself a professional chef or even a qualified foodie, I share a lot of recipes because as a mom, dinner is one of the most stressful responsibilities I have. I’m constantly weighing competing priorities when it comes to dinner. I want the meal to be healthy so it can nourish our bodies. I want it to taste good. I want it to be quick and easy because like you, I have a lot of other things to do. And because my 40-something metabolism isn’t the calorie-burning machine it was a decade ago, I also need to be wary of carbs and empty calories. 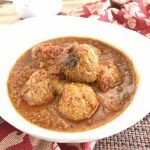 These Instant Pot Mozzarella Stuffed Meatballs balanced those competing goals beautifully! Loaded with protein, calcium, and iron, fun and easy to make, and everyone in the family loves them. Best of all, by using almond flour instead of all-purpose flour, you can cut the carbs and keep this dish paleo and keto compliant. This is a fun recipe to make with the kids, especially since they love getting their hands messy! Recruit their help. You don’t need it since these are so easy to make, but it’s a great way to get the kids comfortable in the kitchen. I don’t shop at specialty grocery stores so the ingredients I use are always ones you can find at your local grocery store. I usually try to keep the total number of ingredients but sometimes, like in this dish, the list includes several herbs and spices to give the meal the right flavor. So, don’t be intimidated by the long list of ingredients. Once you read through it you’ll realize half the list are items you already have in your spice cabinet. 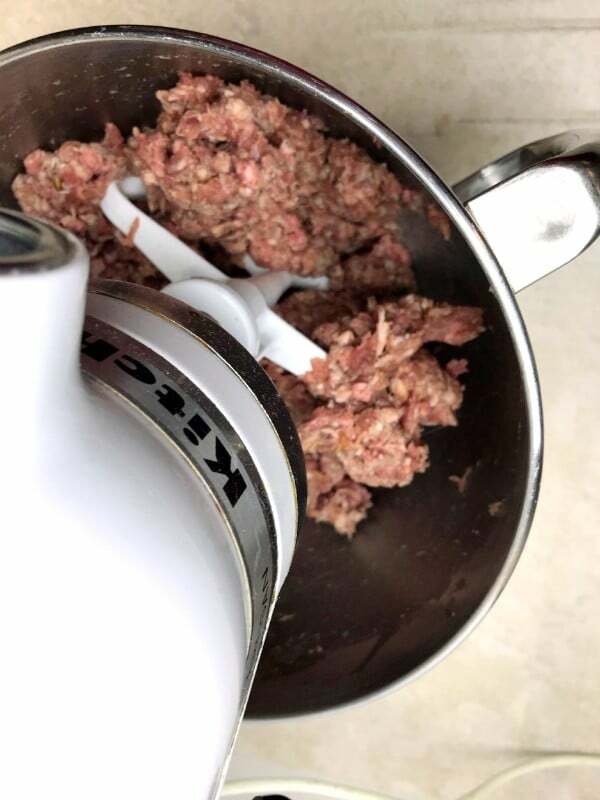 The first thing we need to do is prepare the meatball mixture. In a large bowl, add the ground beef, italian sausage, almond flour, spices, parmesan, eggs. and water. I use hot water since the meat is usually really cold and the hot water makes it easier to handle when you form the meatballs. Stir to combine. I use my Kitchen Aid stand mixer for this. Now, it’s time to form the meatballs. I use a cookie scoop to keep the size of the meatballs uniform. You can also use an ice cream scoop . Next, press a piece of mozzarella into the middle of each ball. I buy a block and cut it into squares, but you can also buy the mini mozzarella balls. 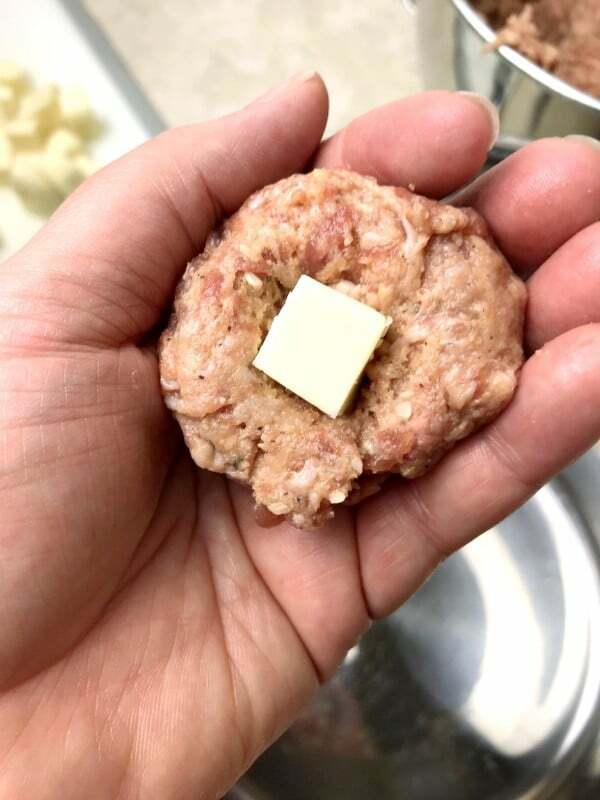 Squeeze the meat around the cheese to encase the cheese in the center of each meatball. Now we just need to make the sauce. In a small bowl, combine the crushed tomatoes and spices. Drizzle a tablespoon of olive oil into the bottom of your Instant Pot liner. Then, add one cup of the sauce. Layer the meatballs on top of the sauce, stacking them after the base layer is formed. Pour the remaining sauce over the top of the meatballs. Secure the lid of your Instant Pot and make sure the valve is set to sealing. Press Manual or Pressure Cook (depending on your IP model) and set the time for 7 minutes. When the Instant Pot beeps at the end of the cook time, wait 5 minutes before turning the valve to venting. 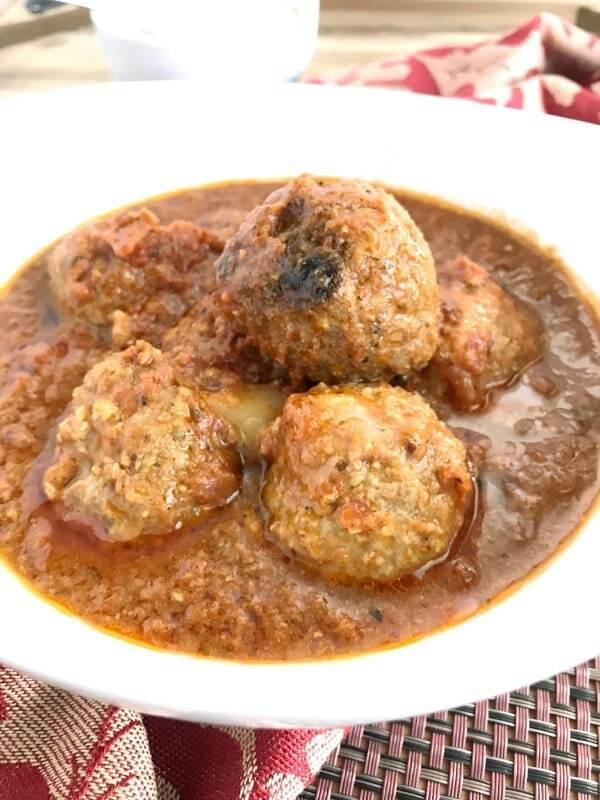 Your meatballs are ready to serve! Top with grated parmesan cheese. If you aren’t watching your carbs, you can serve the meatballs over spaghetti if you want. In a stand mixer, combine together ground beef, italian sausage, almond flour, basil, oregano, garlic, salt, pepper, parmesan, eggs and water. Mix until combined. 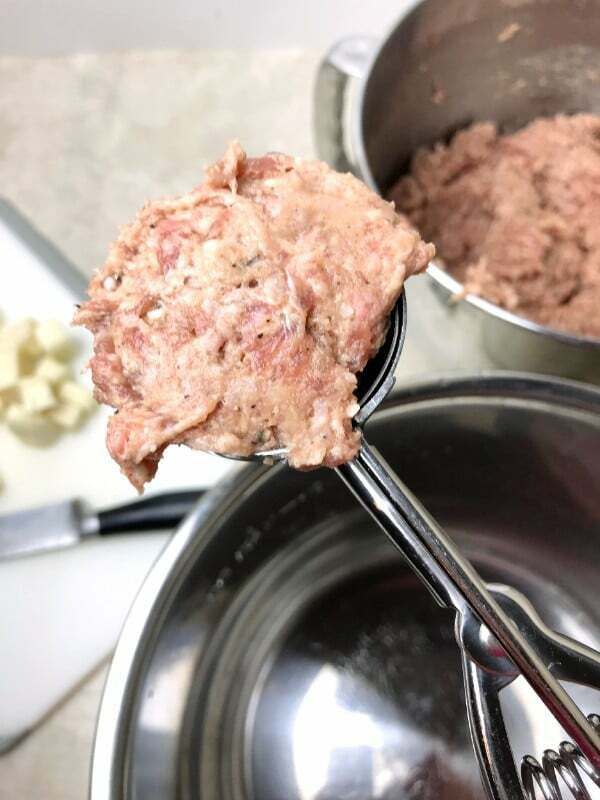 Using a large cookie or ice cream scoop, scoop meat mixture into balls. Press a piece of mozzarella into the middle of each ball and close the meat around the cheese. Repeat the process until all meatballs are prepared. 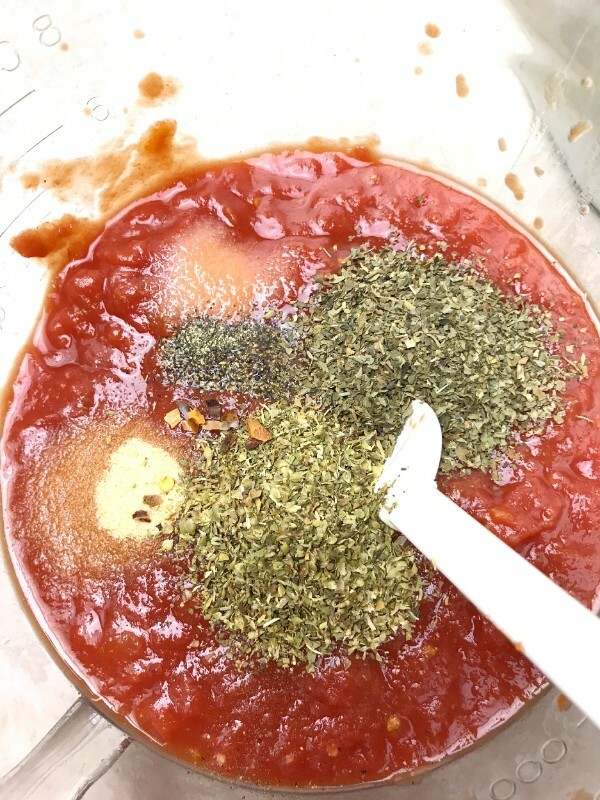 In a small bowl, combine the crush tomatoes, garlic, basil, and oregano. Add the olive oil to the Instant Pot. Add one cup of the tomato sauce. 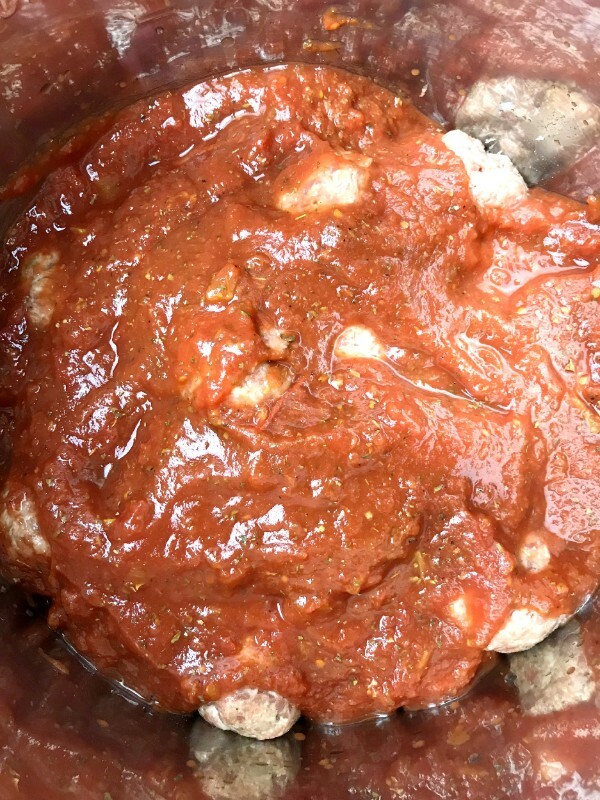 Place raw meatballs over the tomato sauce, stacking once the bottom is covered. Top with remaining tomato sauce. Put the lid on the pressure cooker and set the valve to sealing. Press “manual” or “pressure cook” and set time for 7 minutes on high pressure. When the cook time ends, let the pressure release naturally for 5 minutes, then turn valve to venting to quick release the remaining pressure. 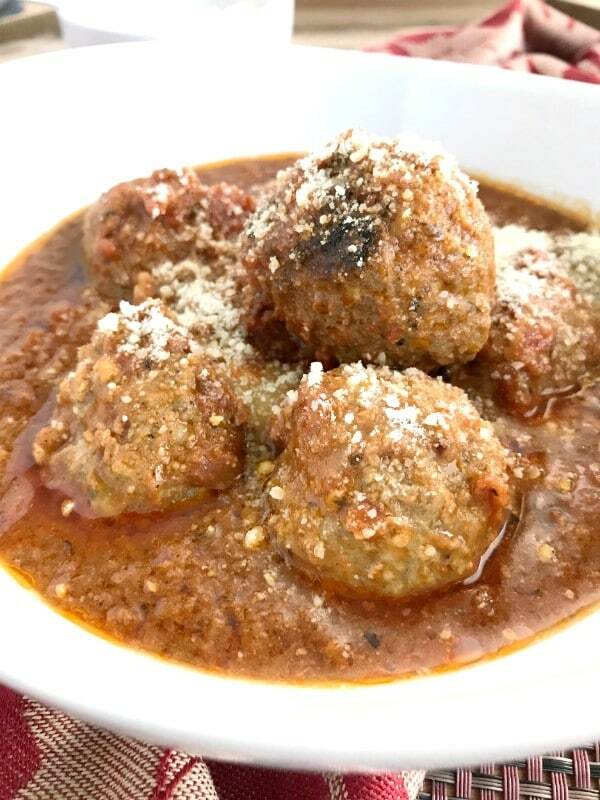 Oh my, these meatballs look delicious. I’ll be Pinning this recipe for future use. Thanks for sharing on Sunday’s Best.